In June 2015, after a historic grassroots campaign, left-wing coalition Ahora Madrid (Now Madrid) was elected to govern in Spain’s capital, Madrid. Headed by charismatic former judge Manuela Carmena, the minority administration put an end to twenty-four years of right-wing rule. It was a phenomenon that was replicated in many other cities across the country as a wave of progressive municipal governments, backed by anti-austerity party Podemos, came to power. Expectations were high: Ahora Madrid promised a break with the European Union’s pensée unique of austerity and privatization. Its program included pledges to end housing evictions, create a public investment bank, and remunicipalize privately run public services, as well as increase opportunities for direct democracy in the city. However, after nearly two years in office, the administration is facing a crossroads, locked in a battle with a national government that aims to force it to abandon its program and impose swinging cuts. Jacobin contributor Eoghan Gilmartin spoke to Madrid city councilors about the challenges their administration faces, the political differences between its constituent factions, and the path forward for the left government of Spain’s capital. June 2015 saw Spain elect a series of “rebel cities,” left-wing urban governments committed to challenging the country’s austerity regime. Winning power in some of Spain’s biggest cities — from Madrid and Barcelona to Zaragoza, Valencia, and La Coruña — they posed a significant problem for the Partido Popular (PP) national government. Its solution was to impose a set of fiscal rules and legal constraints to crack down on the rebellion. In recent months tensions have risen sharply between Mariano Rajoy’s government and the council in Madrid. The latest confrontation has seen PP finance minister Cristobal Montoro demand the council cut €238 million (or 7 percent) from this year’s expenditure to remain within the limits of the state’s spending ceiling. This is despite the council already running a large surplus and being one of the few institutions in Spain to meet their debt reduction targets. The response from the municipal government has been guarded, indicative of Carmena’s aversion to open political confrontation. Somewhat ambiguously, the council announced it would both meet its requirements under the spending ceiling and ensure there are no cuts to existing expenditure or investment. This will be achieved by disputing the amount to be cut in the courts and various forms of creative accounting, such as reallocation of unspent capital funds from last year. Opinion is divided among the Left in Madrid about how to evaluate the administration’s restrained response to such pressure, as well as their record more generally. The dominant emotion among the activist-led organizations in Ahora Madrid, such as the citizen platform Ganemos and the radical Izquierda Anticapitalista (IA) wing of Podemos, is one of frustration. For IA councilor Rommy Arce, Carmena’s inner circle had repeatedly prioritized respectable technocratic management over implementing the “collectively designed program” of the Left. This was a point echoed by the Ganemos councilor Pablo Carmona who also criticized the unilateral manner in which Carmena discarded key elements of the formation’s program without any open debate. At the other end of the spectrum, Podemos councilor Jorge García Castaño defends the mayor, arguing that the reality of governing in minority had in fact exceeded his own initial expectations. While he believes that the left coalition “had no option” but to make concessions on issues such remunicipalization and evictions, they have also secured a number of impressive social advances. The council has increased social spending by over 50 percent since taking office, municipal investment has gone up by 33 percent in the last year, and they are currently implementing an ambitious program of participatory budgets. For Castaño, these advances constitute the potential ground from which progressive forces in Madrid can establish “a cycle of electoral victories” similar in length to the preceding reign of the PP. At the start of my interview with Eduardo Garzón, the Marxist economist and adviser to the council’s treasury, reminded me that Ahora Madrid is “not organized as a compact and coherent political force.” Instead it is a much looser alliance which includes not only parties such Podemos, Izquierda Unida, and the environmental coalition EQUO but also various other organizations and independent figures. 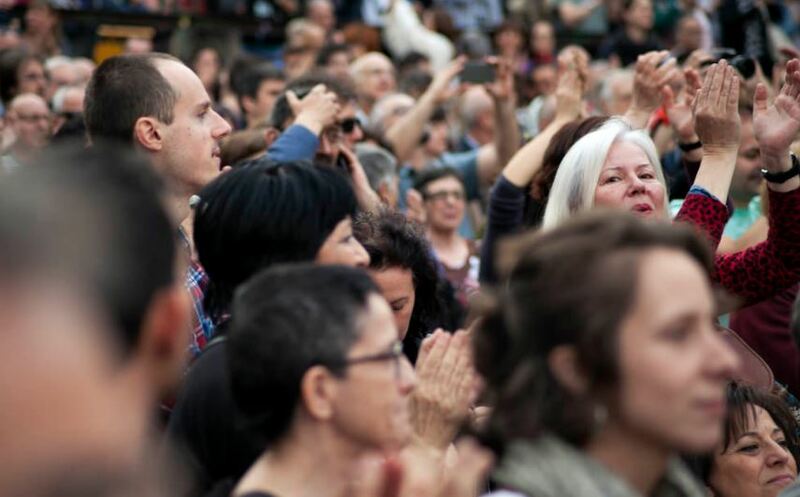 The coalition was quickly assembled in the months prior to municipal elections in 2015 and unlike Ada Colau’s Barcelona en Comú, it lacked a clear leadership and decision-making structures. Yet these diverse groups were united by a number of shared strategic principles, which have informed Ahora Madrid’s more ambitious policy initiatives. The first of these was a commitment to take institutional power so as to defend the public sphere from being further dismantled by the Spanish right. Garzón highlights in particular their record on social housing. In the wake of the financial crisis, the previous PP administration initiated a fire sale of properties held by the municipal housing body, selling off four thousand homes to investment funds (including 1,800 to Blackstone) and had planned to sell a further two thousand homes prior to the 2015 elections. Ahora Madrid cancelled the latter sale and have set in motion a plan to restore the public housing stock to pre-crisis levels, promising to build more than four thousand homes by the end of the legislature, while also buying up hundreds of empty apartments around the capital. He also points to the various vital services that have benefited from the council’s large increases in social spending and investment. The budget for home help for the elderly was increased by 25 percent, the program of free school meals had its funds increased by 50 percent, while the council have invested heavily in extending the network of public preschools, women’s shelters, and municipal sports centers. It has also implemented a new program ensuring undocumented immigrants have access to public services, such as health care. Ahora Madrid’s second commitment was to build on the legacy of the “indignados” (15-M) movement which had occupied the city’s Puerta del Sol in 2011. The group believed that municipal politics could be transformed into a space in which people could become actively involved in the running of their local communities. Here again the new administration has made progress since taking office, instituting a range of participatory channels from a citywide referendum on major urban renewal projects to more decentralized consultations on how to allocate funds in particular neighborhoods. For both Rommy Arce and Garzón, this had to be a process; Spain’s limited tradition of direct citizen participation in institutional politics necessitated slowly building up awareness and encouraging involvement. While small compared to the overall population of the city, the numbers involved in the council’s participatory budget scheme, which allocates €100 million of funds, has increased by 68 percent this year, from twenty-two thousand participants in 2016 to thirty-eight thousand. The final commitment was to systematically transform Madrid’s antiquated urban model. After decades of inaction by PP administrations, García Castaño argued, the council’s ambitious plans — pollution reduction, widespread pedestrianization, and parking restrictions in the city center — are trying to do in three years what other cities in Europe have set out to achieve in fifteen. The aim is to move Madrid quickly towards a more sustainable and livable city less dominated by private transport. Their policy advances represent a substantive achievement, but Ahora Madrid has also faced a series of legal and political restrictions that have hindered their pursuit of many of their core electoral promises. This has been a generalized experience for the so-called “rebel city councils” across Spain, with the new municipalista administrations finding themselves constrained by binding contracts with corporate service providers, court rulings on evictions, and strict austerity rules imposed by the PP national government. Furthermore, the Madrid council have faced massive pressure from a hostile corporate media intent on smearing them as dangerous and too radical to run the city. In this context, the Carmena administration has pursued a guarded strategy, picking their battles carefully and often choosing to yield instead of getting embroiled in open confrontations. This has created tensions within the coalition. Of Ahora Madrid’s twenty councilors, a block of between six and eight, including Izquierda Unida’s Carlos Sánchez Mato, the administration’s head of finance, have repeatedly pushed for it to take a more forceful line, going as far as to vote against their formation on a number of occasions. For Arce, another of these dissenters, the task for the municipal government is twofold: “You have to manage the institutions, and we are doing that. Everything is functioning. But, on the other hand, we didn’t arrive here simply to administer ‘the possible’. The Socialist Party (PSOE) already exists for that.” Instead, she said, a left coalition also has to be able challenge institutional limits, transforming the apparatus at the same time as administering it. But this requires a political will that, for Arce, has often been lacking in Ahora Madrid. She points to one of the council’s most controversial decisions — not to take back control of the city’s waste collection services when the contracts expired last year. Such public services have become the domain of large construction conglomerates looking to diversify after the property crash and are riven with inefficiency brought about by profiteering. Breaking with this model of corporate-run public services would have required not only taking on these conglomerates, who were applying massive pressure through the media, but also having to circumvent the limits placed on hiring new public employees. Sánchez Mato’s proposal was to incorporate the existing workforce “through the back door” by giving them an “indefinite but not permanent” contract which would have exempted them from the quota. However, this would have required negotiating with the unions while also holding off the PP government’s inevitable retaliation. Arce acknowledges the hazards involved here but argues that “it’s our duty.” The radical left cannot, she says, give in to established forces threatening chaos but rather “has to incorporate elements of risk in its strategy so as to advance.” But, according to Pablo Carmona, such resolve was made more difficult to sustain by the administration’s growing distance from its social base. If the administration had been serious about pushing forward, it would have “opened up a debate with civil society” through assemblies, protests, and rallies that could have mobilized public support and social pressure. Instead the council withdrew behind closed doors to make key programmatic decisions. Carmona contrasts the forms of direct democracy that have been implemented in less politicized areas by the council with its denial of grassroots participation around more fundamental questions. Choosing to manage more politicized issues from above, according to Arce, has meant retreat on key elements of its program such as their stance on evictions and occupations. The Left requires mass mobilization so as to create a more favorable balance of forces, and serious political confrontations can be the catalyst for this. It cannot confront the interests of elite sectors, she argued, without the active involvement of popular social forces. But for those who support the mayor’s line, such as García Castaño, the governing minority’s limited strength negates “such an extreme interpretation of the (formation’s) program.” He believes it has been more important in the first years in office to generate confidence among those beyond left-wing circles, by delivering tangible change such as the investments in social programs, than trying to impose their program in its entirety. For him “clearly there was a desire to recover major services” but to risk the credibility of the administration by pursuing such a policy under existing conditions was too much of a gamble. With the set of measures known as the Montoro Laws, the PP government had liquidated much of the economic autonomy of local governments, leaving the council with little room to maneuver. In the case of remunicipalizing waste collection, the threat that either an industrial dispute or legal action taken by Montoro could lead to serious disruptions in services was seen as too great by Carmena. Her predecessor Ana Botella had never recovered after the disastrous street cleaning strike in 2013. Similarly, on the question of complying with the spending ceiling, for those in Carmena’s circle the council is seen as having few cards to play. Montoro has the legal authority not only to impose the cuts unilaterally but also to dismiss Sánchez Mato as the council’s head of finance if the budget is not revised in line with mandated spending limits. To openly defy the law, they say, would embroil the council in fruitless controversy. Instead the aim should be to legally dispute the figure. Like García Castaño, a number of Carmena’s closest allies come from the more moderate Errejonista wing of Podemos. One of the points of contention between Íñigo Errejón and Pablo Iglesias at the party’s recent congress was the former’s claim that Podemos risked overestimating the level of political rupture acceptable to the majority of the population. Here, the political hegemony of an insurgent force has to be built up slowly across the institutions by proving to voters that rather than being a source of instability, it can defend and strengthen the public sphere. The type of political stand-offs that the minority on the council wanted to engage in, from this perspective, risked derailing the administration before it developed. Instead, the aim should be to accumulate further institutional power by demonstrating to voters the Left’s ability to deliver progressive reforms. In this respect, García Castaño sees their record on investment, social spending, and urban renewal as an effective basis from which to fight for both re-election to the council and Errejón’s own candidacy in the regional elections in Madrid in 2019. This would allow Ahora Madrid and Podemos to reinforce their position in the institutions and to push policy further in a progressive direction. In particular an Errejón-led regional government would give Podemos control over health and education, thus providing them with the opportunity to protect the public provision of these vital services from further attack. Given the hostility they have faced from the media and business interests, Ahora Madrid’s progress has been remarkable. But, halfway through their term, the coalition, like the Left in general in Spain, is at a crossroads. Should it continue along a more institutional, transversal path with the hope of electoral hegemony? Or take a more militant approach which seeks the active involvement of society in the struggle for radical change? The calculation of the Errejonistas is that after forty years of neoliberalism, it is unrealistic in our atomized societies to expect a high degree of popular mobilization or sustained political commitment. In contrast, the radical municipalistas on the council (and to large extent, the Pablistas at Podemos’s national level) are betting on a new wave of social struggle developing durable forms of popular association capable of challenging the power of the Spanish oligarchy.